Welcome to Team Double 3 Racing! We, the Nel family as TD3, would like to wish all our Family, Friends and Supporters welcome to our website where we'd like to share just a little bit of ourselves and our racing life with you all. We hope to see you all safe and sound at the track or at home, at the very least just hear from you. I first saw and fell in love with the MV Brand in the 80's during a display at Kyalami of one of Agostini's Race bikes, then even more in 1999 when I saw a F4 at Phakisa Raceway. The next time I saw a MV was long after we had immigrated to Australia, and that was to change our lives dramaticaly. 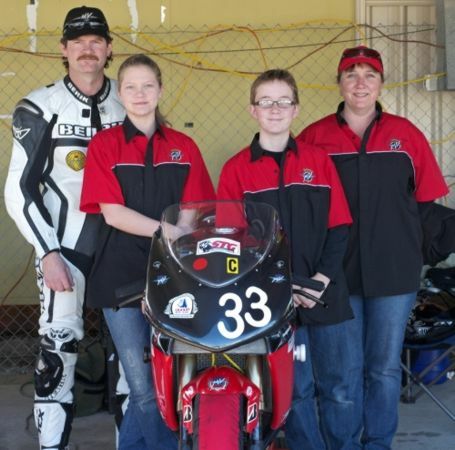 I followed the progress made by the likes of Kevin Curtin, Luca Scassa, and other racers around the world on the MV�s in years gone by with great envy. So...when the opportunity arose for us to buy our own MV in 2008 we decided on the Brutale 910s, budget and license worries at the forefront of the decision. That is where it all started, from the Brutale we progressed to a MY06 F4 1000 R and we now have 2 of them, race trim only, no more road riding I'm afraid.